Lets Blow Our Coat Month! It’s “Let’s Blow Our Coat Month” here at the My Brown Newfies household. Actually it started at the end of last month but we’ll dedicate April as the month to blow coat because it’s the “real” first full month of Spring. Since not everyone may have a dog that blows coat we’ll start with some of the basics of blowing coat. 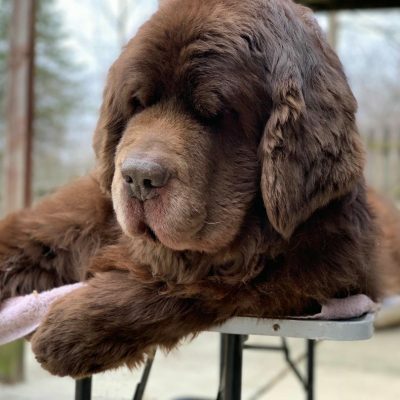 All dogs shed but those with a thick undercoat such as the Newfoundland can shed heavily about 1-3 times a year based on the climate that they live in, what type of coat they have and the dog in general. 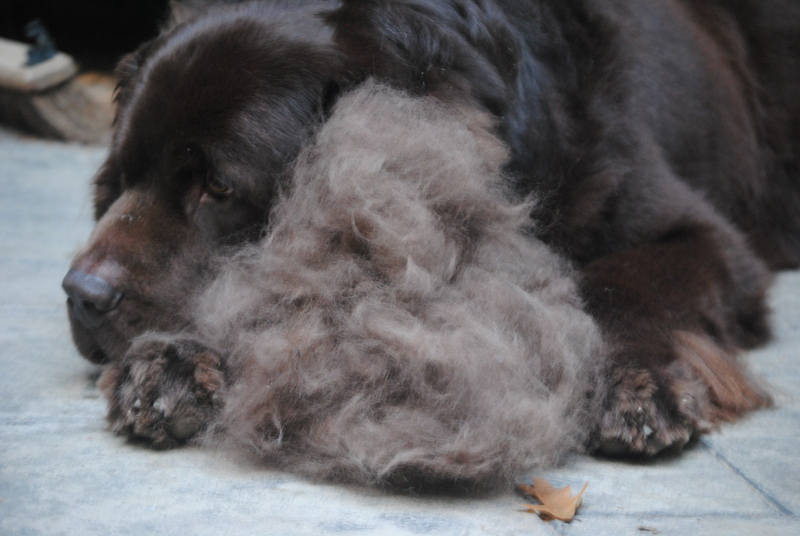 When a dog blows coat they are shedding their undercoat and it usually happens over a few weeks to up to a months time. Some may blow longer than that though. My dogs blow coat usually in the Spring and the Fall. The Spring blow, or fur explosion as I like to call it, is usually a bit heavier than the Fall blow because they are blowing all of their thick Winter undercoat. I can normally tell the dogs are going to have a fur explosion when I start to see tufts of hair that are just waiting to be plucked sticking out of their fur and when I give them a hug my clothes are covered in a thin layer of Newfie hair. What can I say? Jeans covered in Newfie hair is a fashion statement just waiting to happen. Neither one of the boys truly blew their coat until they were 2 years old and Leroy has always blown coat in a much bigger volume than Sherman. So what do I do when they blow coat? I make sure my vacuum is in proper working order, I make sure I have a ton of dry swifters and I brush, brush, brush! Right now they go up on the grooming table 1-2 times a week and before brushing I will blow as much loose hair out as I can with the dog dyer and then I’ll spritz their coats with grooming spray and brush, brush and brush some more. In between trips up on the grooming table I will brush them on the floor daily for about 1/2 hour each or until they have decided they have had enough of me. My favorite brush to use is a pin brush from Chris Christensen (20mm oblong), and when I really get in to it I will bring out the combs and the rake. So do you have a dog with a fur explosion going on right now? How do you handle it? What’s your favorite grooming tool to use? Any tips you would like to share? When Zip was here, the house was always full of FUR! I loved the Chris Christensen brushes!! Now….we just go to the groomer!! No more dog hair! Aren’t the Chris Christensen brushes the best? I just got my first one about 1.5 years ago and I love it! Suprised you don’t have a furminator…that brush took out the undercoat on my lab that I never even knew existed. It is pricey…$50-60 but returnable and satisfaction guaranteed. Wholly hair…you can spin that and make well anything! Little Leroy blankets crocheted or knitted…yeah creepy but possible. What’s the difference between Alpalca fur and Newfoundland fur? I use a Mars Coat King to remove the undercoat from some of the thinker areas on the boys, like their chest and pants. 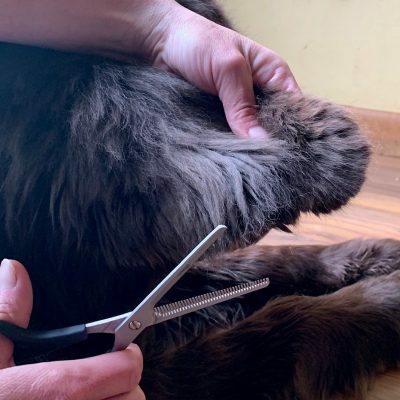 I don’t use a furminator though because I have heard that the blade on it will cut the guard hairs and leave them with a frizzy look, which is not what I wanted when we were showing, but I do have the rake and comb from furminators grooming line and I love them! But, with that being said I do know a lot of people who love their furminators! Not quite sure the difference between Alpaca fur and Newfie fur, maybe the Alpaca hair is finer???? ?Not quite sure but I could ask around for you! Those are actually horrible as they rip out and break the top coat hairs. You’re trying to get to the dead undercoat hairs not destroy the coat. Haha! I’m glad the horses aren’t allowed in the house. That would make for quite a mess! Now, does a horse shed shorter hair? We’ve already had a mini-fur explosion, though I attribute that to Starr no longer being a stray and living outdoors. One morning my other half got up and asked my why it looked like a chicken had been killed at the top of our stairs – oops! Little miss fluffball had a tuft, which made another tuft, which made another tuft…well, you get the picture! Haha! I’m picturing the scene right now! I can certainly understand what you mean by tufts upon tufts! With my Lab & GSD I used to talk about brushing out “enough hair to build a whole new dog” but I never did it…So seeing Harry the Dog had be rolling in laughter…Thank you! Haha! I did that a few years ago when I saw someone else do it! I thought it was a hilarious but my husband though I was losing my mind! I think its time for another Harry! You has a whole udder dog right theres. What you should do is knit me a sweater withs all dat hair. We just might do that someday Puddles! My Kuvasz sister has a 24/7/365 fur explosion…she sheds all the time and we always have her fur around but that is normal for her breed. She does shed heavier in the spring and fall. I don’t shed really, so she sheds enough for us both and then some! Haha! I bet Katie sheds just as much as Sherman and Leroy does with all that pretty, thick white fur! We have had birds here that have scooped up some fur laying on the ground and added to their nests, it always makes me smile! Thankfully our shelties are smaller, but with two the fur bombs that go off are amazingly messy. As you mentioned, the vaccuum is your friend. Grandma provided us with a strong one several years ago and it is our main assault on the coat blow. What I find hilarious is the fur bombs that rise out of the coats as soon as the brush even approaches the coats. They are more like fur mines that explode with these huge fur puffs into your eyes, sticking to your clothes, etc. Lol! I know what you are talking about! It’s like the brush is a magnet for those fur bombs! I went to work the other day and was covered in hair before I even saw my first patient! Oh wow. We have a fur explosion, but not quite like that! We just furminate. Every day. I bet your furminator gets a lot of overtime! Have you ever had your sister spin up some of the fluffy undercoat? It makes a a wonderful yarn! Quite similar to Angora. I always blend my dog fluff 50/50 with wool so that it has more elasticity and it develops a beautiful, angora-like “halo” when you knit with the resulting yarn! If Kristi doesn’t want to try it, send me a bunch ~ I’ll spin it up for you! Nancy, Kristi and I have talked about this for the last few years and I even started a bag of fur for her but we still haven’t gotten around to do anything with it! We have all the resources we need to do something great, we just need to do it! I would love to one day make a pair of mittens with the Newf hair and wool! Thank you for the offer to spin it!I may take you up on that! I can only imagine what it is like at your house! I bet we could make a coat from each dogs fur! Oh could imagine the pretty colors we could combine! Torrey blew her coat when we were in Arizona. Now she is just shedding like normal. I use a rake on her, then brush brush. Torrey got a head start on all of us! My corgis are double coated and they blow coat twice a year as well. They also shed the outer guard hairs ALL.YEAR.LONG. It’s a losing battle to be hair free, so you just have to learn to vacuum more often. One thing that helps get the hair out is a nice long, sudsy, warm bath. It seems to loosen up the undercoat and wash it away. A good brushing once dry finishes things off. You are so right about the baths! I am hoping this weekend it will be warm enough for me to get at least one of the bathed and knock some of that loose hair out! Bea has a hair explosion to match your two. Buddy has less of a coat so its not too bad with him. I just purchased a Furminator from Amazon and Dad tried it outside yesterday on both of them. It is self cleaning which was a good thing since each stroke of the brush on Bea rendered it full of dog hair – lol. She will get it again today and I will continue to do this daily out on the front lawn. My Dyson animal is ready for the challenge! Vicki, did you get the actual furminator or one of the brushes/rakes? just curious! I love my Dyson! It’s the only vacuum that has held up around here! Before that we use to but a vacuum every 2 months! I’ve had my Dyson for over 2 years now and only have had to take it in for service once! There are so many things we can make! Some people leave dog fur out for the birds to make nests from. You have enough for a colony of eagle apartments. Lol! We do! I have had birds pick up the fur before and add it to their nests. It always makes me smile when I see it! Both my dogs get those little tufts sticking out, it is mostly on the backs of their legs by their butts but they don’t blow nearly as much as your dogs do. I can’t resist those little tufts! I always have to pull them out. I even do it to dogs at work! I have a slicker brush too, I should really use it more! Holy cow, that’s a lotta hair! I know exactly what you are talking about! We use to use one of those on our Collie that I had when I was a kid! I have no idea where we got it from! 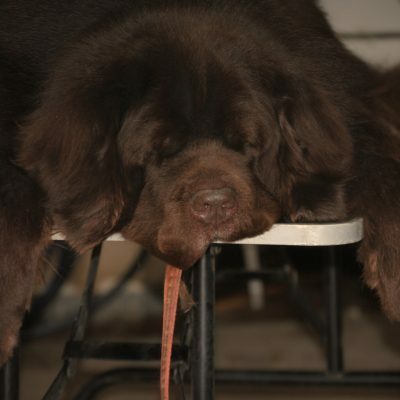 Riley has an undercoat too, although not as thick and long as the Newf’s. She blows her coat about twice a year usually (depending on the crazy Virginia weather). I see tufts of hair hanging on for dear life on her coat and I can’t help myself but to pull them all out! I usually try to use the FURminator a few times a week. I’m always amazed at how much hair comes off. It does kind of break the outer coat some though, which I’m not happy with, but I haven’t really found anything better. Maybe you can recommend something? Those tufts are so hard to resist! but I have to be careful with it because it is really easy to get carried away! I was afraid to use it at first, but I really like it now! It is a lot of hair! The second picture is an old one and I think it was both of their hair combined from one grooming session, but at the rate Leroy is blowing right now-I might be able to get just as much! I’ll say the same thing I said to the Websters…Holy squirrel poop!!!! Thats alot of furs!! you should thinks abouts going into the sweater knitting business….I do thinks Newfie Sweaters would be come all the craze this fall…. Ma said her Old English Sheepdog used to do the same thing. She used to take a little bit of her everywhere she went! It somehow gots ‘woven’ into some of her clothes! Lol! I always have a few Newf hairs on me, no matter what! I have though about using the fur to make things before, I just have to actually do it! ONE of my dogs will probably not even shed as much hair in a life time as one of your dogs sheds in a year!! Are you saving the fur to be spun into wool? I think that a Leroy or Sherman sweater would be a super idea. Last year I saved a small bag of fur but then after a few months I threw it away. I really need to save it this year and spin it into something. I’ve wanted to do that for quite some time now. Wow that is a lot of fur! We usually swim our dogs to blow their coats. It works quick. Unfortunately our ponds are still too cold to swim in! I bet before we know it those ponds will be all ready for a swim! Holy cow. I always grumble about the poodle sized hairballs that gather in e corners during coat blowing time but I guess I better shut up! 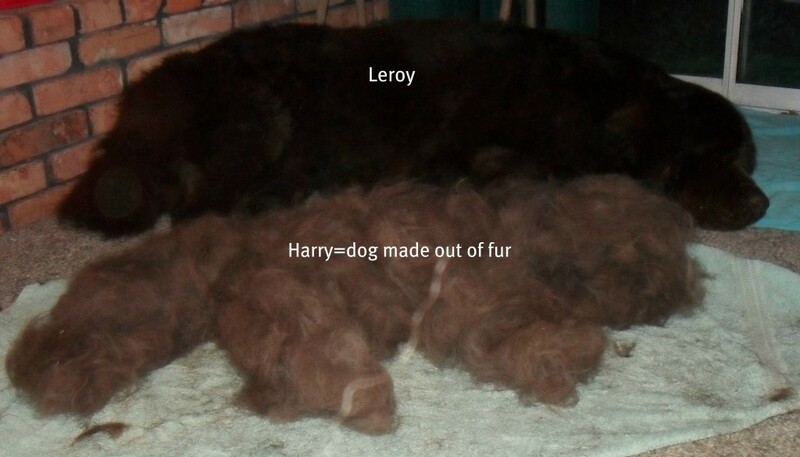 I have joked for years about making another dog out of that hair so I still haven’t stopped laughing about the picture of Leroy and his shedded twin! I bet your poodles leave some nice tumble weeds in the house too! ROTFLMAO! OMG, that fur dog is amazing…and a little crazy. Good luck with all that fur. Are you going to do anything special with it all? Newfie fur coat maybe?? One of these days I will make something, I have too! A black and grey Harry would be so cool! I know. I know. I have got to do this! I love to pluck the tufts! Harry is quite a unique dog 😉 Cheyenne blew her coat really bad this past few months, in fact so bad I could see skin but it finally started to come back in just this past week. I like to use a wire comb. OMD, you could see her skin? Now that’s a good coat blow! When Blueberry blows her coat, I cry a lot and shake my fist at the fur that blows across the kitchen floor like tumbleweeds. I don’t know how you handle it with those two giant boys! Can I send you some kleenex for the crying? Honestly, when I am about ready to schedule a blood test to see if Blueberry has a thyroid issue, that’s when the blowing finally ends. Love the all fur dog! That is a true work of art! I have two Newfies (Bella and Bear) and the season is underway for blowing of the Coats! I just got a Mars Coat King–I’m a little afraid to use it–any tips? Hi I always blow the coat out first with my dog blower. the natural oils in the coat help release the shedding hair. Then I brush threw it then a bath and a cream rinse or conditioner. Then after rinse I use a spray in product called stuff. It works great! Then I blow them out till they are totally dry.